In the wake of reported air attacks on civilian crowds by the Libyan airforce, former Foreign Secretary Lord David Owen has called on the UN Security Council to immediately meet in emergency session and authorise a ‘No Fly Zone’ over Libya. In the wake of reported air attacks on civilian crowds by the Libyan Air Force, former foreign secretary David Owen has called on the UN Security Council to immediately meet in emergency session and authorise a ‘No Fly Zone’ over Libya. Speaking on al Jazeera, Lord Owen called for a UN Charter Chapter 7 intervention – meaning the authorisation of both military and non-military means to “restore international peace and security” – to be enforced by NATO air forces with Egyptian military support to demonstrate regional backing for the effort. “The UN Security Council should meet in emergency session tonight and declare the situation in Libya as a threat to peace under Chapter 7 of the UN Charter and declare a no flight zone for the Libyan Air Force and ask the regional power, NATO, to enforce it from dawn tomorrow. If other countries intervene in the Libyan situation there is a very real danger people will rally under Gaddafi against external control. If we blockade arm sales to Libya we stop him supplying his forces and allow the military the option of mutiny. Britain is now obligated to intervene and establish a no-fly zone. The military hardware we have supplied in the past is now being used in contravention of the export licenses ie for internal suppression. We are now obligated to enforce those licences and decommission the weaponry. 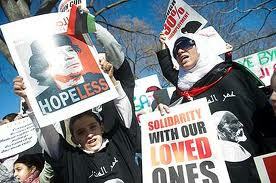 UN should authorise NATO and Egypt to enforce Libyan ‘No Fly Zone’ to protect civilians….Now!! RT @unitonehifi: UN should authorise NATO and Egypt to enforce Libyan ‘No Fly Zone’ to protect civilians….Now! !